Light winds on the second day of the Finn Gold Cup in Gaeta meant only one race could be sailed. 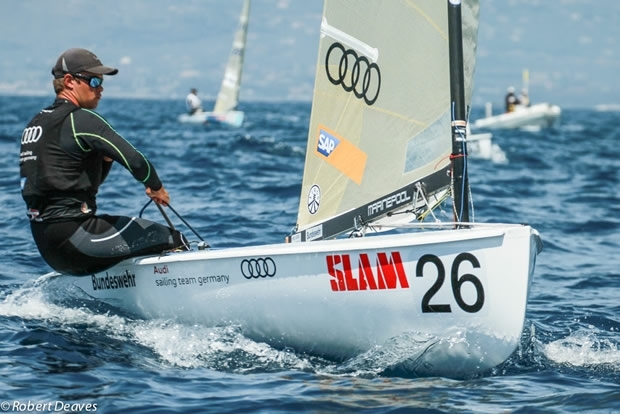 Phillip Kasueske (GER) sailed very well to win his first ever major international Finn race. The win moves him up to second overall after three races behind Deniss Karpak (EST), who placed 13th in the race. Piotr Kula (POL) crossed in third to end the day in third overall. For the second day running the fleet were held on shore for an hour before going afloat and the postponement continued afloat for a while before one race was sailed in 6-9 knots. There were a number of high profile black flag disqualifications including long time race leader Jorge Zarif (BRA). In fact, four out of the top 10 finishers crossed the line to find their sail number on the board. While defending championship Giles Scott (GBR) recovered from around 12th at the top mark to second at the finish to end the day in seventh overall, Piotr Kula (POL) recorded his second top three place in a row to cross in third and rise to third overall. “I am very happy with how I am going this week, but not happy that it didn't happen a month ago when we had the Olympic trials.” Poland failed to qualify for the Olympics. Racing is scheduled to continue on Tuesday at 13.00 with even lighter winds forecast, though better wind is expected for the rest of the week.